I found Shafeena through the wonderful group of food bloggers in the UAE – Fooderati Arabia. 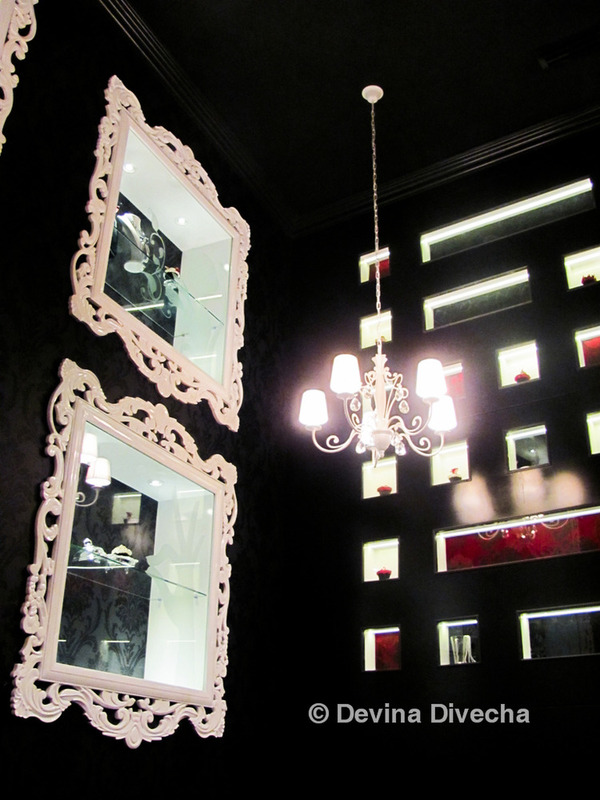 One day, over a year ago, I saw pictures of her cupcake store, Bloomsbury’s, based in Abu Dhabi. 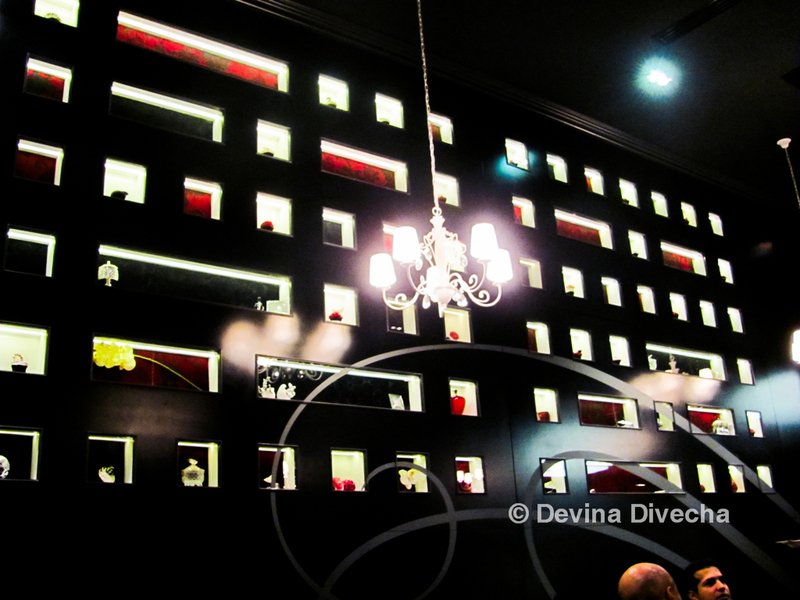 It intrigued me, and as a reporter on the B2B title, Commercial Interior Design, I saw potential for a feature. And potential it was. It gave me my first cover story on the magazine [here’s the actual feature about the interiors] and also introduced me to the world of cupcakes that actually had a moist base. See, that’s the problem with most cupcakes – the top is all soft, fluffy and happiness personified, but the base, the actual cake, is drier than a dead dinosaur’s bones in the desert. Not Bloomsbury’s cupcakes though. This is one thing I can vouch for with all honesty and sincerity. And I’m not saying this just because Shafeena is a friend. I wouldn’t subject myself to bad cupcakes, no matter how good friends I am with someone. These cupcakes are stellar. Anyway, Bloomsbury’s started out in Abu Dhabi and I rued not being able to go there for my Bloomsbury’s fix. 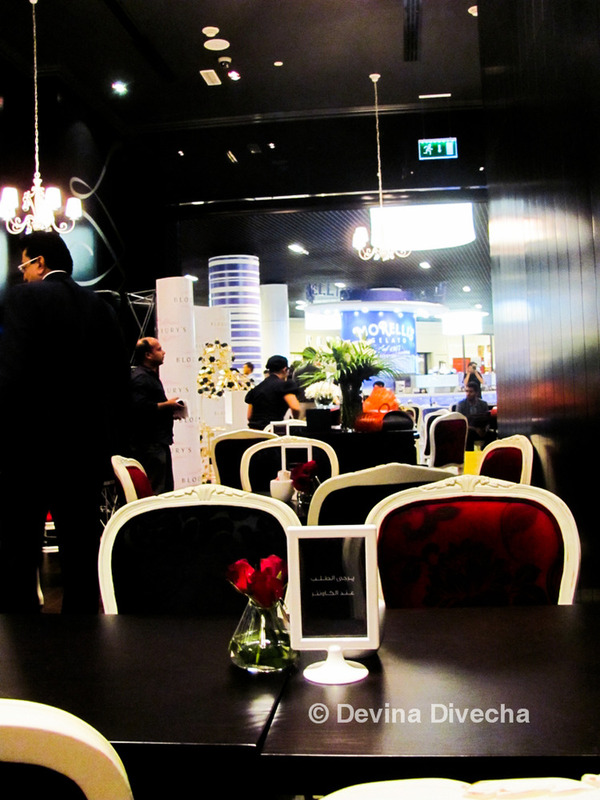 And then, at Taste of Dubai 2012 I was given great news – Bloomsbury’s was opening in Dubai Mall! I was invited to the opening last night, June 28 2012, where Shafeena was also unveiling the world’s most expensive edible cupcake (I believe its cost was $1,100; correct me if I’m wrong Shafeena!). I did try a little spoonful of it, and it was extremely rich in taste. I’m hoping it breaks a world record – it deserves it. I arrived late (because I was at a work event, not because I was following the fashionable Dubai/Indian sense of punctuality) but better late than never! The interiors, this time completely overseen by my dear friend and food blogger, Dina Murali, stayed true to the original concept of vintage decadence Bloomsbury’s espoused. It’s a place to sit down, relax and feel like royalty. 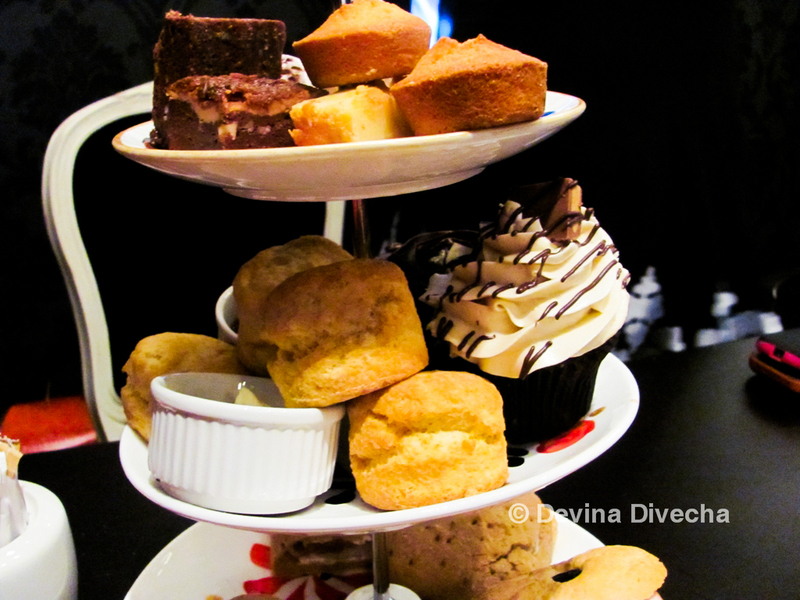 In addition to the delectable cupcakes, Bloomsbury’s is now offering afternoon tea. And I was impressed. For AED 55/- per person, you get two freshly baked scones, three freshly cut sandwiches, one Valrohna chocolate brownie, three mini meringues, one cupcake, two freshly baked blondies, two freshly baked financiers, accompanied by clotted cream and strawberry jam. There’s also an extensive choice of tea: Jing Assam Breakfast, Organic Gun Powder Green Tea, Jing Earl Grey, Darjeeling 2nd flush, Organic Bohea Lapsang, Organic Jasmine Silver Needle, Vanilla Black Tea, Blackcurrant and Hibiscus, Whole Peppermint Leaf, Whole Lemon Verbena Leaf and Rooibos. There’s also the option to have coffee. The best part? The afternoon tea runs from 3-8pm, so even if you’re wandering about a bit late in the day, you can still sample the delicious fare. 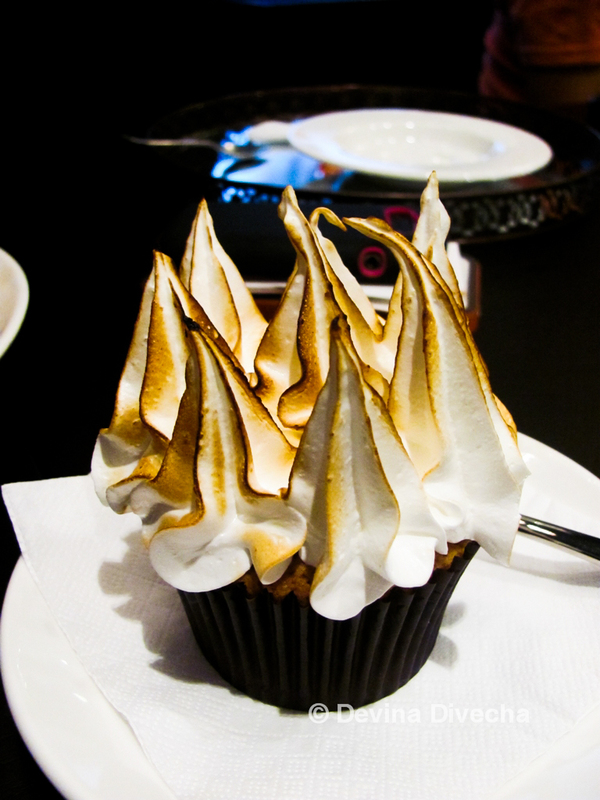 The lovely Shafeena also treated me to caramel cappuccino and key lime cupcake. I’ll say this – I don’t like caramel very much, but that coffee was amazing. I told her as well – when I like a dish that contains an ingredient I don’t like, I salute it. So if you’re looking for the best cupcakes you’ll find in the UAE… what are you waiting for? 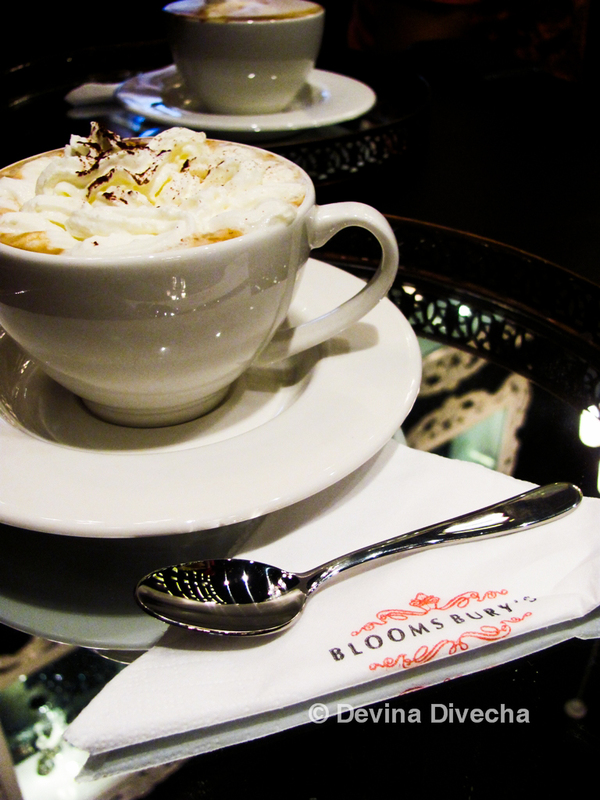 Bloomsbury’s is on the Lower Ground floor in Dubai Mall, and can also be found Al Wahda Mall and Al Mushrif Mall in Abu Dhabi. Practical tips: Park in the Fashion Avenue, closest to the Burj Khalifa side and walk it up! Go with an empty stomach and be fully prepared for an awesome sugar rush. Venue looks nice, will definitely stop by next time I’m around Dubai Mall… though don’t think it really needs that gimmicky $1,100 cupcake. Seems a bit silly don’t you think? Ohhh The 55 aed afternoon tea is such a good deal 🙂 Very reasonably priced for Dubai Mall! Could be shared between 3 girlfriends 🙂 Congrats Shafeena and Dina! Waiting to return to Dubai and drop in here… am hearing so much about Shafeena’s cupcakes!